Mix all the dry ingredients together in a bowl, make a well, pour in oil and enough water to make a stiff dough. Cover the dough with cling film and allow to double in size. Turn onto a floured board and shape in to a smooth ball, divide in half and shape each half. Place both halves into a 2 lb greased and floured bread tin and allow to double in size. Place in oven and cook for 30-35 minutes or until golden brown. I used olive oil as that is what I had. I dissolved the sugar in some warm water taken from the 500ml added the yeast and left for ten minutes until it was foamy. I haven't used instant yeast with this yet. It works well with the active dry. I didn't divide the dough in two. I just plopped it all in the loaf tin. Von the tin I used was slightly bigger.23.5 x 13.3 x 6.99 cm. I actually got these tins for Nigella's loaf cakes as I had overflow problems. They are very good for a big loaf of bresd to slice for sandwiches etc. I love the no-knead method. 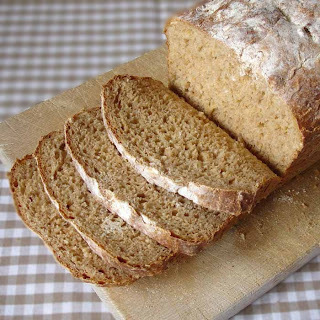 I have some wholemeal spelt in the pantry that I will now use to make this. It looks really yummy. I wonder if you could keep this in the fridge prior to baking like you can with many of the other no-knead recipes? Hi Deb, I really can't see why you can't pop it in the fridge. It certainly won't harm the yeast. Gorgeous looking bread Brenda. I just love this recipe. That looks like a gorgeous bread! I use spelt in all my baking, but have so far been too scared of yeast breads. I am going to try this! mmm, spelt bread is delicious. Hi Granny - I have seen many versions of the no-knead - do you think pouring the dough after its second rise in a crockpot warm from the oven with a lid on would make a difference?? Thanks a lot for your suggestions!